In Israel, No Welcome Mat For African Migrants Israeli officials have stepped up efforts to stem the flow of African asylum seekers and migrant workers into Israel. The measures include a $270 million fence along the border with Egypt, a new detention center, a crackdown on employers and repatriation of Africans already in Israel. Dozens of African migrants cross into southern Israel through the border with Egypt last week. Construction has begun on a $270 million, 87-mile fence along the porous border. It's one of four measures proposed to try to stem the flow of African migrants into Israel. Israeli officials have stepped up efforts to stem the flow of African asylum seekers and migrant workers into Israel. With numbers reaching into the tens of thousands, Israeli officials are pressed to find a policy to combat the ever-increasing flow of people. Israeli construction workers are battling against the blustery wind and sandstorms to build a fence across one stretch of desert. The $270 million fence will cover 87 miles of Israel's southern border with Egypt. African refugees are smuggled through this area almost daily. They travel thousands of miles and often spend their life savings to try to reach Israel, a country they see as their doorstep to the West. Israel, however, is far from laying down the welcome mat. Sigal Rosen is an organizer at the Hotline for Migrant Workers, an advocacy group for refugees, in Tel Aviv. She says that though Israel signed the Geneva Convention relating to refugees, it regularly violates it. "During the last years, Israel is sending a very clear message to all asylum seekers: Beware. We are not interested in your presence here. We will do whatever is in our power to prevent you from being here, even if the price is violating our legal commitments," Rosen says. 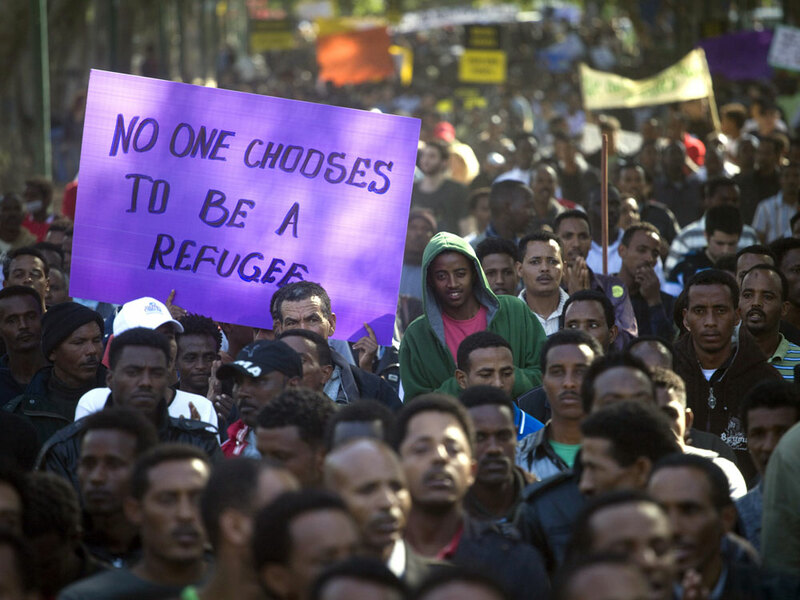 Thousands of Israelis and African migrants demonstrate in Tel Aviv last week against plans to build a detention camp to house refugees who have come to Israel in recent years. As the number of Africans seeking refuge in Israel has risen, so has the number of people who walk through the door of Rosen's office, trying to figure out their rights in Israel. Oscar Olivier is one of those people. Originally from the Democratic Republic of Congo, Olivier has lived in Israel for 16 years with no official status. "I don't even have a residency, and today after 16 years, I don't have a work permit," he says. Olivier lives in a small apartment outside Tel Aviv's Central Bus Station. The area has been nicknamed "Little Africa" because of the thousands of refugees who have settled there. Olivier's spartan room is undecorated except for photos of his 8-year-old daughter. It's for her that he has toughed out all these years, working as a janitor and house cleaner in what he calls an unfriendly environment. "Not only to feel that you are not welcome, but to know that [you] are not welcome. So it ends up not a place for people who are different. It's a place where people should be, look, all the same," he says. Speaking in Israel's parliament recently, Interior Minister Eli Yishai called the refugees an "existential threat" to Israel, one that could challenge the Jewish majority his party has sworn to protect. "We will find ourselves in a situation where there will be hundreds of thousands of these people on our doorstep. So should we be scared of kicking them out?" he said. On Nov. 22, the same day that work began on the fence along the Egyptian border, Yishai presented his four-part plan to make Israel a less desirable locale for refugees. In addition to the fence, Israel is building a detention center that will operate as a yet undefined "open facility" for any would-be refugee who decides to remain in Israel. The third step in Yishai's plan is to punish any employer who hires African migrants or supports their employment. 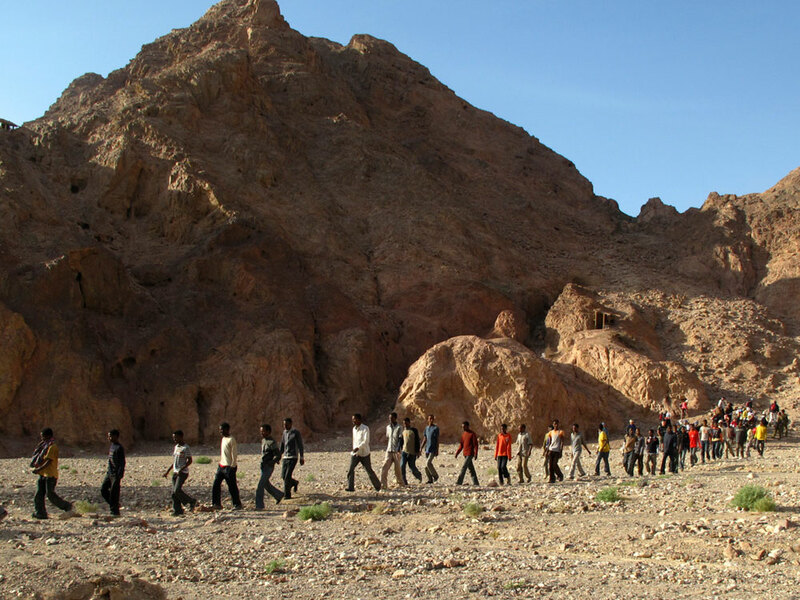 The last step is the repatriation of refugees who are already in Israel. Israel took that step for the first time -- last week -- when it removed 150 southern Sudanese who agreed to leave voluntarily in exchange for some pocket money and a flight home in time to vote in the upcoming referendum on the region's independence. Olivier, however, questions just how voluntary their removal was. "They've been pushed in the corner. They've been put in the situation where that one was the only solution for them," he says. At the Hotline for Migrant Workers, Rosen says she knows many more who would consider leaving Israel if they were given a similar deal. Most of them, she says, have become fed up. "Actually, Israel doesn't have an immigration policy. What we have is a big mess," she says. Olivier agrees. When asked about his dreams for the future, he says he just wants to see his family settled in a place where they feel safe and welcomed.